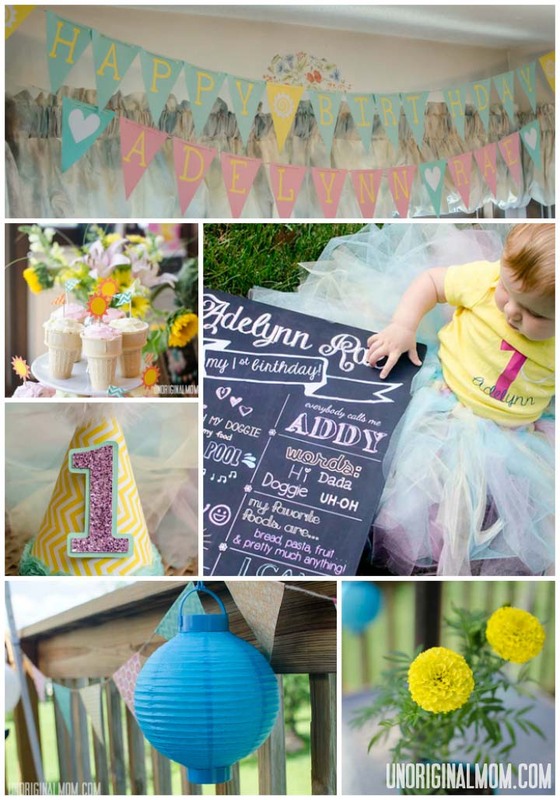 You’ve been seeing bits and pieces of this party for a while now…but here is the official “round-up” post of all the elements that went into Addy’s You Are My Sunshine First Birthday Party! I am a little disappointed that I didn’t put more time/effort into taking photos at the party…I grabbed a few before guests started to arrive, but missed a few key elements…and I didn’t take many during the actual party. Boo. Oh well, live and learn, I suppose. We hosted the party at my parents house (thanks, Mom & Dad!) because our townhouse is much too little for something like this. Plus, they have a great deck and backyard that is perfect for summer parties! (Didn’t get any good photos of the outside set-up, sorry!) We had a wading pool and sprinkler set up outside for the little ones – it was hot! 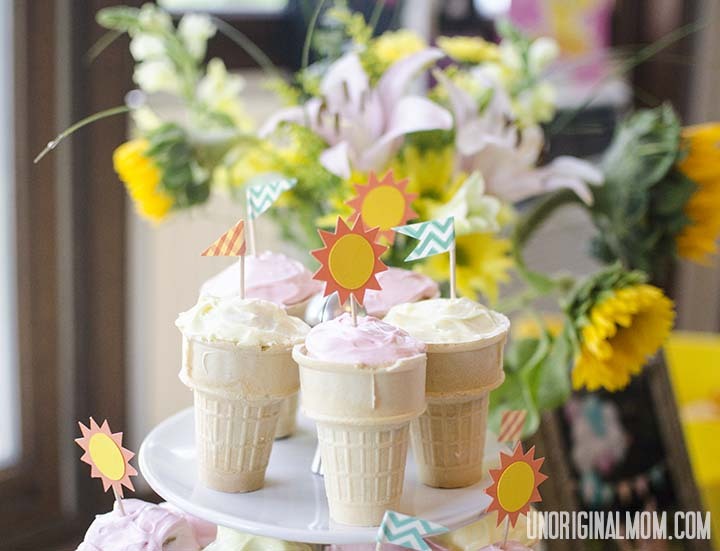 And here are my *mostly* “unoriginal” ideas, inspired by many photos on Pinterest, that comprised my baby girl’s You Are My Sunshine First Birthday Party! 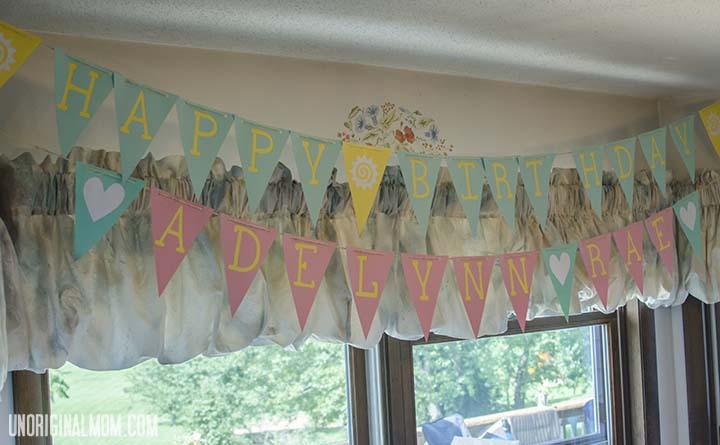 Using my Silhouette, I made a “Happy Birthday” banner for above the food table. 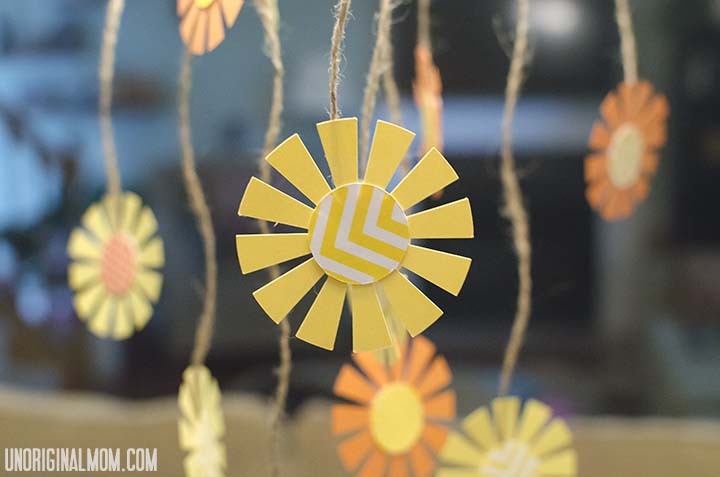 I didn’t get a good shot of these at the party, but I made little hanging sunshines to tie to the chandelier above the food table. I’m especially proud of the First Birthday Board I put together in Photoshop. We used it as part of a photo display (shrine?) 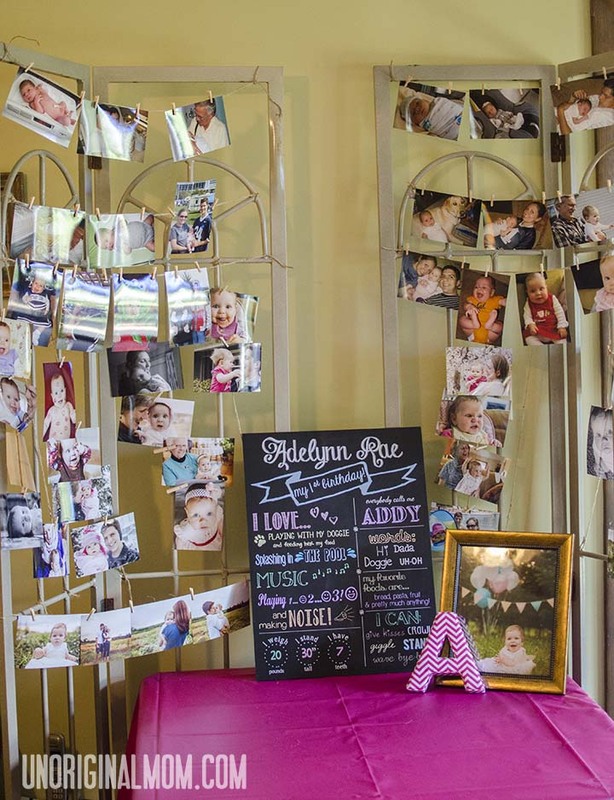 of photos from Addy’s first year. 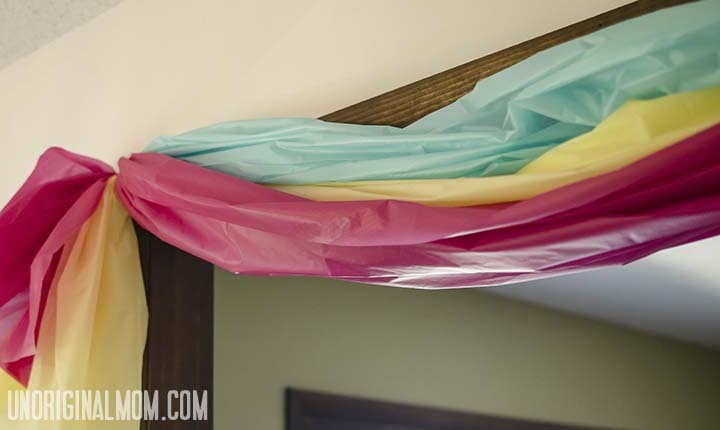 I had extra plastic tableclothes (yay for the dollar store), so I hung them over a door frame to make a little doorway swag. 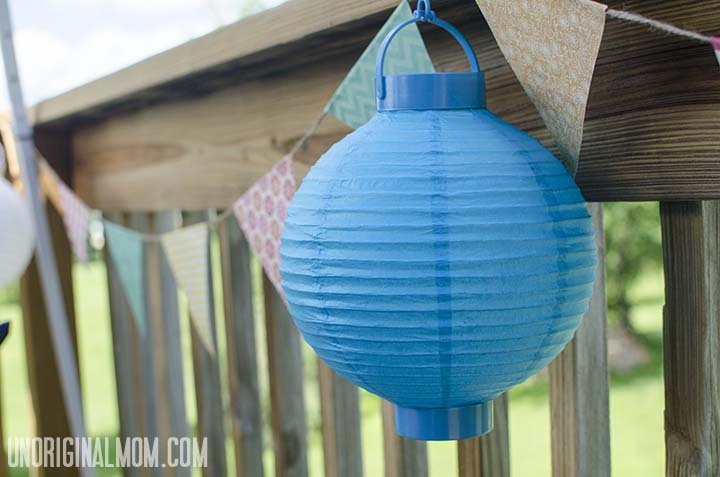 Outside on the deck, I hung this simple scrapbook paper bunting with thumbtacks, and then hung paper lanterns on the thumbtacks. 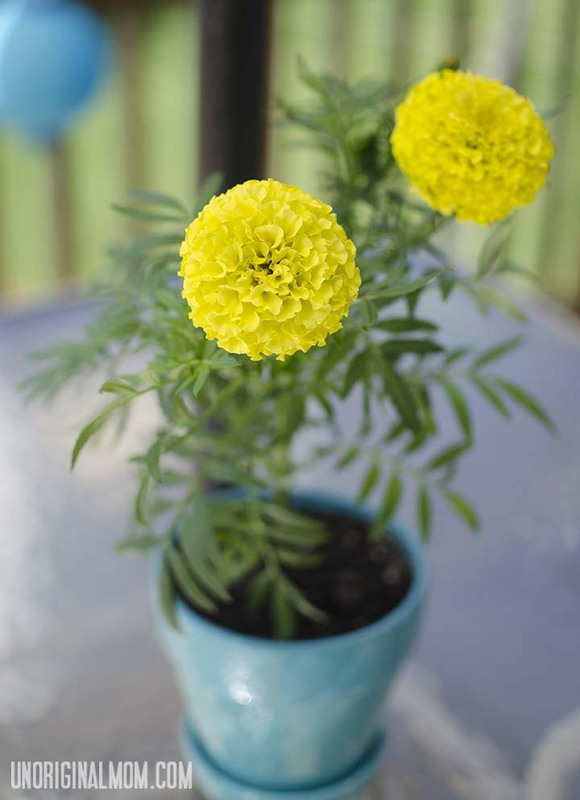 Marigolds are the perfect flower for a sunshine themed party – and very easy centerpieces! 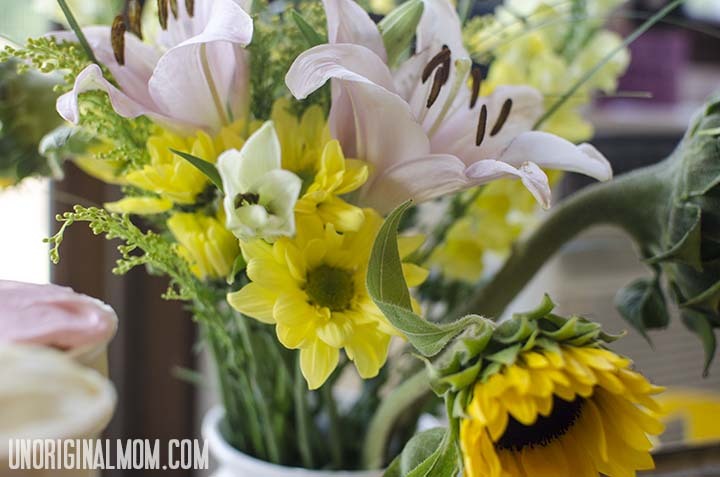 And fresh flowers are an easy and lovely idea for a centerpiece as well – of course, there had to be a sunflower! I made a party hat, onesie, and tutu for Addy’s first birthday outfit. 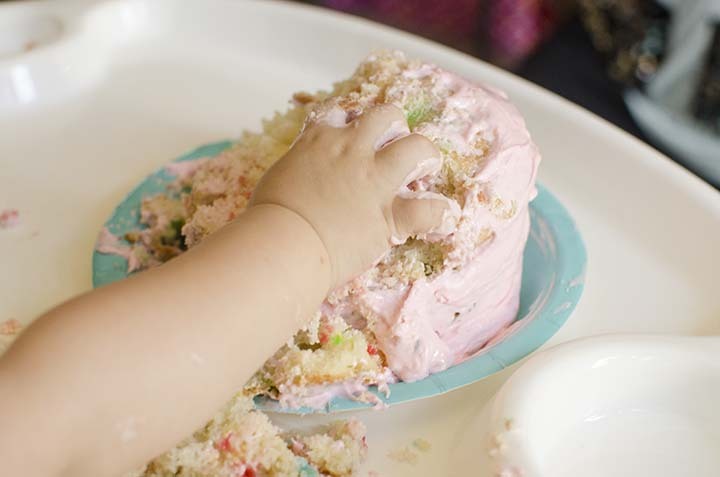 She had her own little smash cake (baked in a medium-sized ramekin dish). 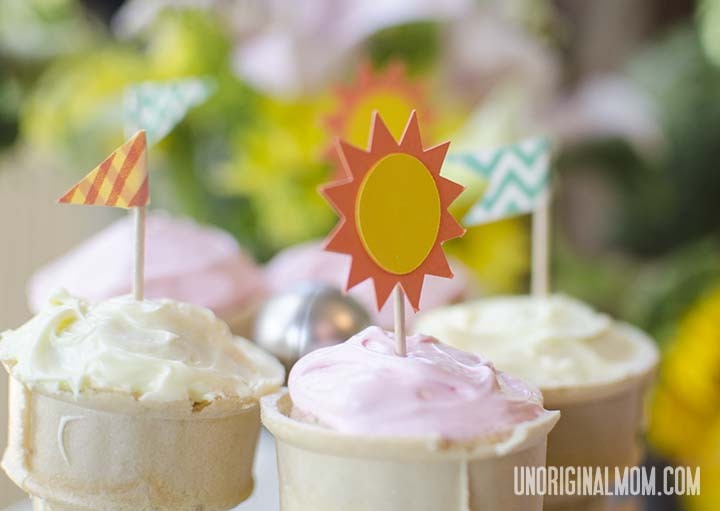 For everyone else, I made cupcake cones, and added cupcake toppers made out of washi tape, sunshines (cut with my Silhouette), and toothpicks. I didn’t get a photo of how we used them at the party, but I cut out little sunshines with my Silhouette and taped them to crepe paper. My sister decorated the front porch with them. I also didn’t get a photo of the drink table (which I am really bummed about!) 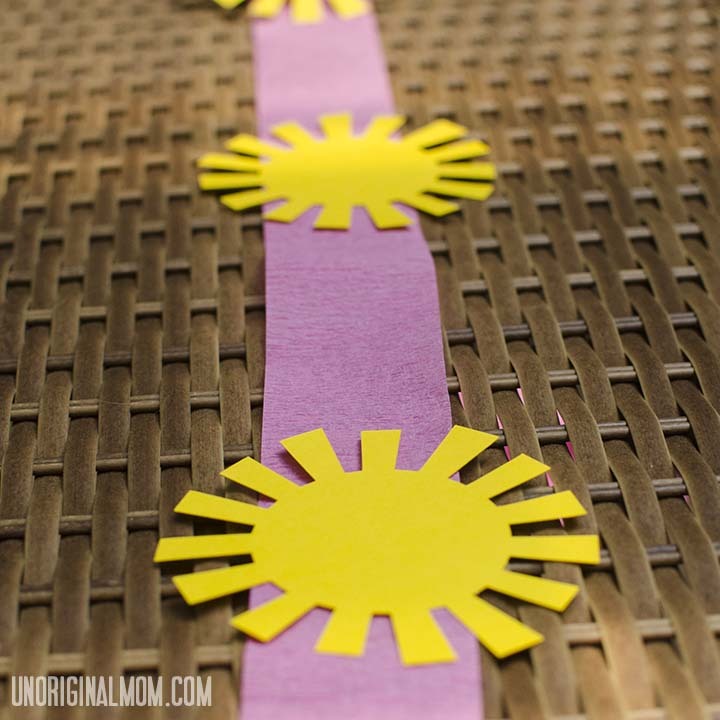 but we had lemonade and cute little pink & turquoise chevron straws from Pick Your Plum. All in all, it was a great party – we had lots of fun celebrating with good friends and family. 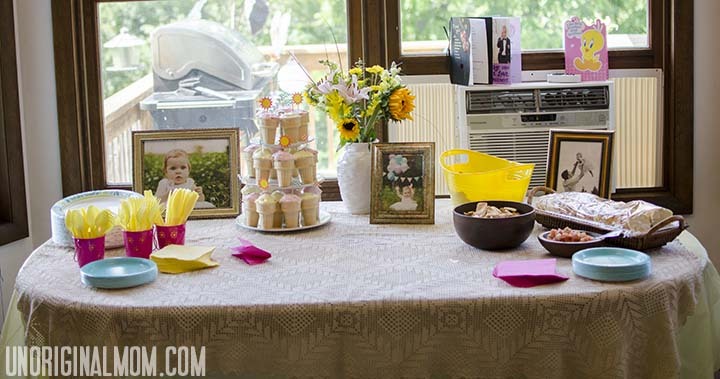 (Click HERE for a recap of the actual party!) I can’t believe my baby girl is one year old! Adorable! You did an amazing job. That photo you have of her in her little outfit and hat – precious!!!! So beautiful! Thanks Kristin! And that photo of her in the outfit is the only one where she is not crying or looking very angry, she was NOT happy to have her picture taken at that moment…I’m glad one of them turned out, haha! Awesome party idea! 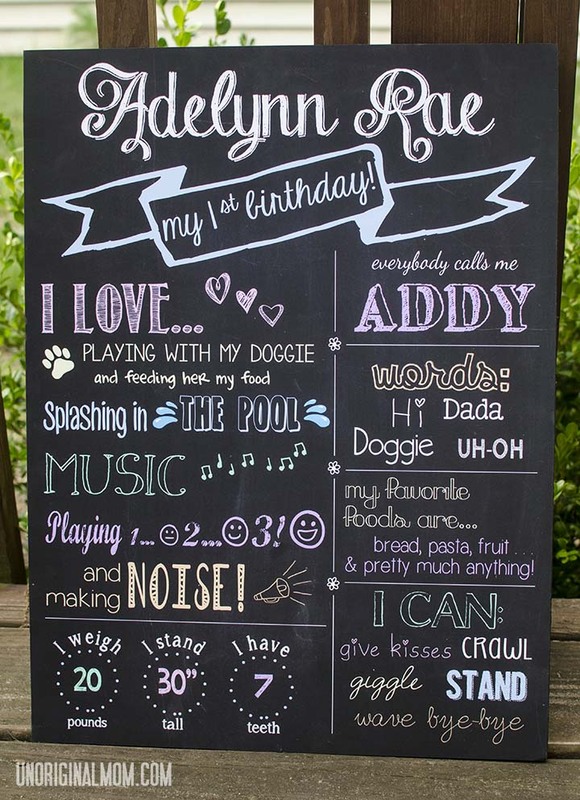 My favorite part is the First Birthday Board! All of your details are so wonderful and cheery! Great ideas! Hi Amy, thanks so much! The birthday board was a labor of love in Photoshop…I didn’t really know what I was doing, haha! I did use a tutorial on how to create the chalkboard effect, but beyond that I pretty much just experimented with different fonts and colors! Thanks Megan :-) I love that picture too…she was SUPER cranky when I was taking these pics, that was probably an I’m-about-to-scream face but out of context it is very cute! What a super cute party. Your daughter’s close up photo is precious! Oh my gosh! 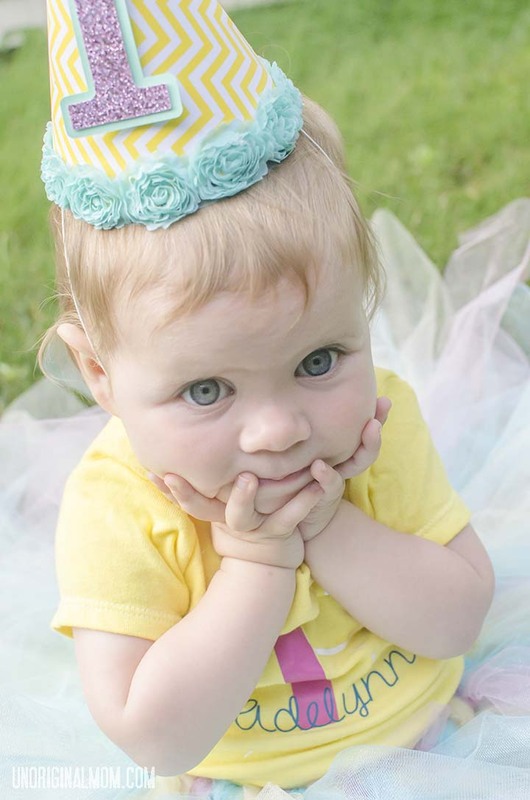 Could your photos (and pretty little girl) be any sweeter!! Love your photos! One of my favorite songs turned into an amazing party. BEAUTIFUL DETAILS! Thanks Holly! One of my favorites, too…and now I sing it to my little girl all the time! I love everything about this party! Adelynn is adorable, and the tutu, onesie, and hat that you made her are so cute! Thanks!! It was definitely a labor of love :-) I don’t think child #2 will be getting a first birthday party quite this elaborate!